…was to fly “high point” U.S. Service men to Casa Blanca, Africa on the first leg of their air lift trip home. Also flew displaced forced laborers from Germany to their respective homelands, i.e. Greece, Turkey, Africa, etc. Symbolic change of command: Col. Theodore R. Milton hands over command of the 384th to Lt. Col. Robert W. Fish on 17 June 1945 at Grafton Underwood. Robert William Fish was born on May 30, 1917 in Gladwin County, Michigan. His parents were Amon Emil and Ethel Bevis Fish and Robert was the third of their seven children. In 1923, the family moved to Ohio. The 1930 Census reports the Fish family living in Claibourne, Union County, Ohio. And the 1940 Census reports that Robert Fish lived in Peoria, Ohio in 1935. 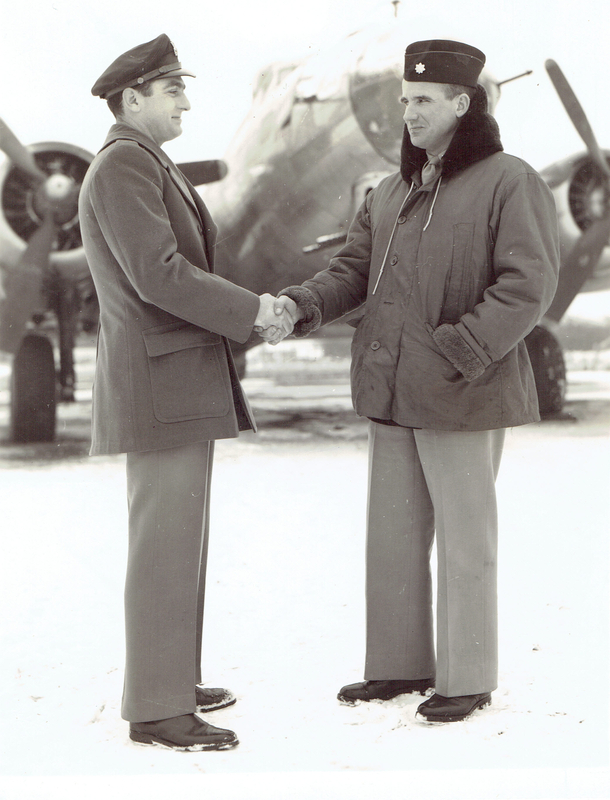 In 1939 Robert joined the Army Air Corps and was trained as a pilot. The 1940 Census (recorded April 9, 1940) shows him living in the Flying Cadet Detachment at Kelly Field in Bexar County, Texas. He had completed two years of college and his occupation was Flying Cadet. His enlistment date is recorded as June 22, 1940, but clearly he was already in pilot training by then. In 1941, he married Jean Young. She was born in 1920 and was from San Antonio. In addition to pilot training, Robert graduated from the Air Tactical School, the Air Command and Staff school, and from the National War College. He also taught in both the Air Tactical and the Air Command and Staff schools. 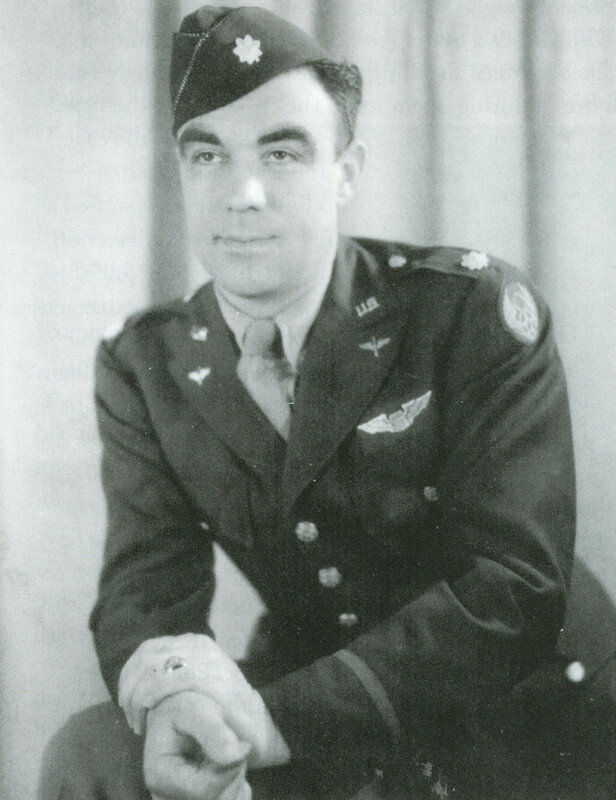 As far as civilian education, he earned a degree in Electrical Engineering (before his service) and a Bachelor’s Degree in Business Administration with a major in Industrial Management (after WWII) from Ohio State University and a Master’s of Arts degree with a major in International Relations from George Washington University. Robert served in many Air Force command and staff positions including twelve years in Washington D.C. He also served in Taipei, Taiwan as Military Attache to the Nationalist Chinese government for two years, which he called an “interesting assignment.” He was the only Defense Attache assigned to a country at war. …At this meeting the officers of the 22nd Squadron were sworn to secrecy and then they were briefed on a new mission being assigned to their unit. This new mission was designated by the code name “Carpetbaggers.” All of the personnel of the 22nd Squadron and only the non-aircrew personnel of the 4th Squadron would be involved. Two new squadrons would be organized from the manpower pool of the two anti-submarine squadrons. Under the code name, “Carpetbaggers,” the two squadrons would be assigned the mission of parachuting saboteurs, intelligence agents, weapons and other supplies to the underground forces of the countries on the continent of Europe that had been overrun by the German Armed Forces. To read more about the Carpetbaggers, see a link to “They Flew by Night” in the Sources below. After serving his country for thirty years and through three wars – WWII, Korea, and Vietnam – Robert retired from the United States Air Force on January 31, 1970. In 1990, Robert published a book entitled “They Flew By Night.” It is subtitled “Memories of 801st/492nd Bombardment Group ‘Carpetbaggers’ as told to Col. Robert W. Fish.” It was privately printed by the 801st/492nd Bombardment Group Association as a memorial to the men of the 801st/492nd Bombardment Group in WWII. The book is a compilation of stories mostly contributed by the men who were members of the group during WWII. It also includes the history of Robert Fish and the group, as well as stories written by Fish. “They Flew by Night” is over four hundred pages long, but can be read in its entirety on the internet. A link to the PDF file is listed below in Sources. In retirement in his home on the shores of Falcon Lake at Zapata, Texas, Robert became active in preserving the history of the Zapata County area and he instigated the formation of the Zapata County Sheriff’s Mounted Posse to carry the fourteen “Flags of Zapata” (the fourteen different flags that have been used to claim jurisdiction over the Zapata County area) in formal parades throughout south Texas. Robert died on October 12, 2008 in San Antonio, Texas. He and Jean had been married sixty-seven years. He is buried in the Fort Sam Houston National Cemetery in San Antonio, Bexar County, Texas in Plot: Section 49, Site 104. Robert’s wife, Jean Young Fish, died March 16 this year and is buried next to her husband. Robert W. Fish’s obituary as published in the San Antonio Express, can be read in its entirety here at Legacy.com. Robert Fish’s book, “They Flew by Night” can be read here. By thearrowheadclub in 384th Bomb Group, Commanding Officers on October 19, 2016 . Where may I get a copy of “They Flew by Night” ? I’m sorry, but I’m having trouble getting the link to display properly. You may need to copy and paste it into your browser or just Google “They flew by night robert fish”. The correct result is “[PDF]They Flew by Night – The Carpetbagger Photographic Archives”.